I recently discovered the Telesin 6″ GoPro dome port, another option for people wanting to shoot over/under, 50/50 or split shots with their GoPro camera. It’s cheaper than the KNEKT KSD6 GoPro dome port which I use currently and the SPL GoPro dome port that I’ve used in the past too. Why use a GoPro Dome? 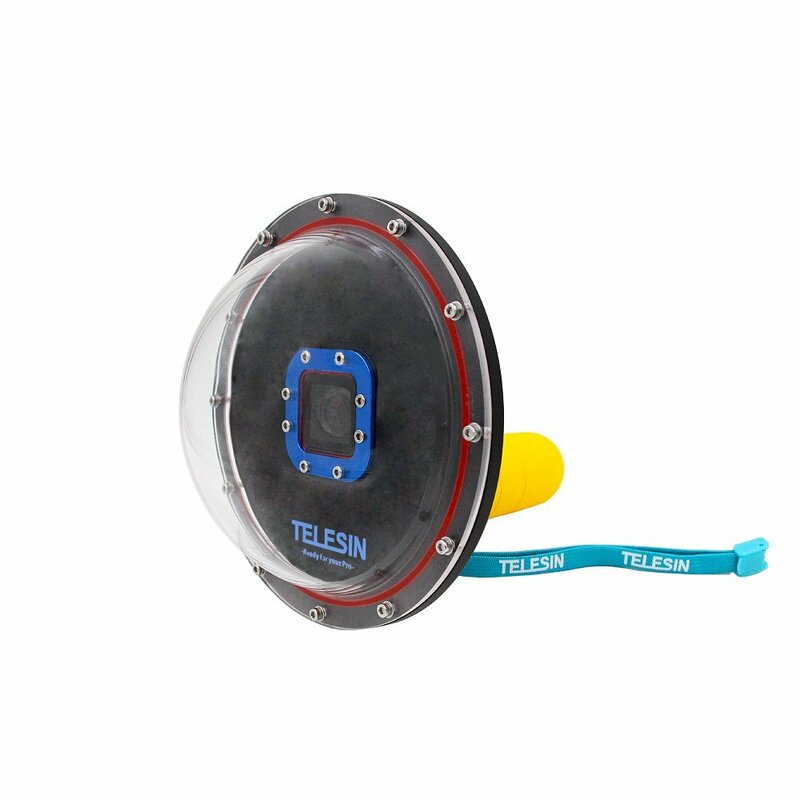 When I was doing some research on the Telesin dome port I also found this listing for the “XCSOURCE 6inch Underwater Photography Dome Port for the Gopro Hero3/3+ Hero4 Camera OS287” – the photos clearly show that it’s also a Telesin branded GoPro dome. The price is $83.99, and XCsource have good feedback as a seller, so it might be worth taking a punt on this one instead if you’re on a tight budget. How does it compare to the KNEKT KSD6 GoPro dome? I currently recommend the KNEKT KSD6 GoPro dome, I use it myself and it’s exceptionally well designed and made. The only reason not to go for the KNEKT option would be the price, i’s $299 for the dome, and I’d say if you;’re serious about using it you’ll probably want to pick up some sort of pistol grip trigger system and a leash too, so it’s a fair investment. 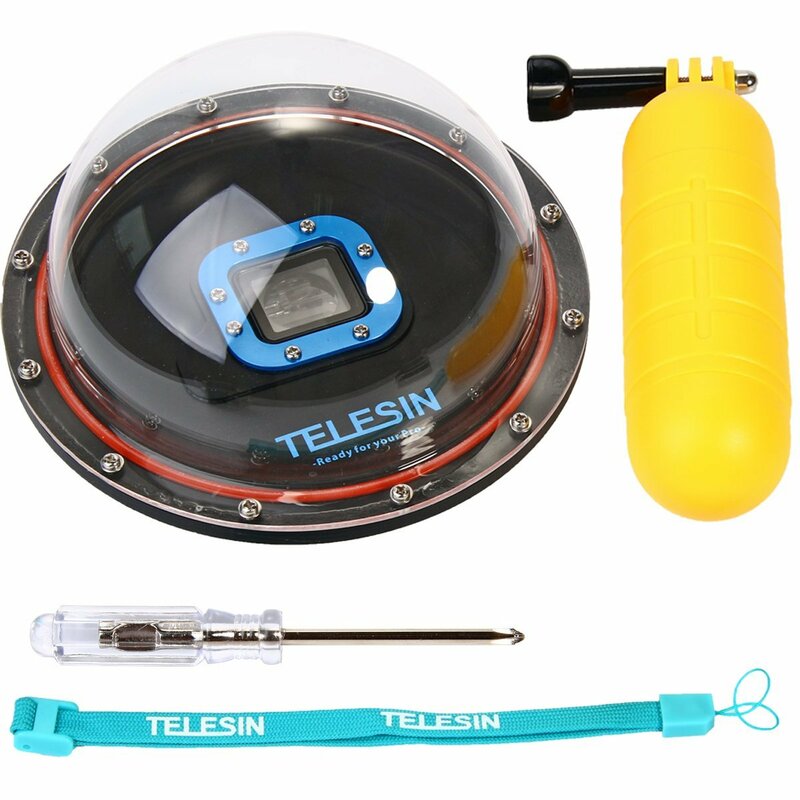 The Telesin GoPro dome comes with a GoPole bobber style handle (I use the original bobber, it does the job), a screwdriver and a wrist lanyard. As you can see you can’t use the front button, which is a pain, as I found out when I used the SPL GoPro dome. KNEKT have solved this problem on the KSD6. He mentions that the GoPro case that is included with the dome is permanently glued to the dome, this could be seen as a plus point, but personally I’d prefer the KNEKT approach of using an o-ring to seal against the GoPro case so you can pop it in and remove it if necessary. If you cracked the bottom mount points on the case for instance it would render the Telesin dome fairly useless, with the KNEKT KSD6 you can just pop in a new case and keep going. You don’t have to check the seals ever, which is nice, but I don’t have to check mine, I just leave my case attached to the dome and use a spare for everything else. The screwdriver is provided in case you want to take the dome off, so replacing it shouldn’t be an issue. It’s possible to take off the KNEKT KSD6 dome port too, it uses a screw down ring around the outside rather than screws. I did think that the blue logo and ring around the lens might show up in reflections on the inside of the dome (I’ve had reflections from my lens hoods on my fisheye shots with a DSLR before) but I didn’t see any in the example photos, so it might not be an issue. The build quality looks OK from the video and the photos, but there are a few drawbacks over the KNEKT design, it looks like a pretty good option for the price though. 5 stars – user Flappytits (!) – got the first one, let water in, replaced by seemingly different design which has been fine for 1 week – interestingly it sounds like the design may have changed, he’s happy with the latest version and I suspect the YouTube user has the newer one too, so maybe there was a bad batch which the other reviewers got and now it’s sorted. Which GoPro dome port do I recommend? I’m sticking with the KNEKT KSD6, you can use the front button, you can open the housing without a little bit of string, it works perfectly with their other triggers and it’s beautifully designed to work perfectly. If you’re on a very tight budget and you don’t mind dealing with the hassles of not having a front button then the Telesin is currently the next best option. I can’t vouch for the quality as I haven’t used one personally but it sounds from the reviews that the latest version is pretty well made. 1. Bad reflection of the camera is seen on over/under shots or totally submerged shots. 2. The unit has a removable dome, the inserts in which the bolts thread onto, the glue that holds them in can be easily cracked and the bolt will start to free spin not allowing you to remove the dome. This happened to me but luckily it was on the last screw and was able to tap out the whole insert from the rear and glued it back in later. Things needed to improve the dome..
1. Open the dome and paint the inside a matte black (of coarse masking off the the go pro lens area). 2. The bolt inserts in which they screw in can be removed, re thread the holes they leave behind with a tapping tool and you will need new stainless screws for this as the size will increase. Thanks for the review Michael, it’s good to hear from someone who’s used the dome and figured out the issues. I’m sure others will benefit from your tips. Thanks Ben, happy to help. So your review is on the cheaper version?? ?